Grand Canyon Trip – BEST Vacation in My Life! I just ordered the free DVD Western River Expeditions offers. 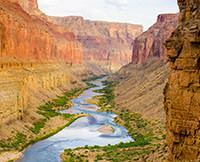 I went with Western River down the Grand Canyon about 20 years ago! Now I want to take my family....my son is only 12 so we have to wait a bit. I just wanted everyone in my family to see how cool a trip it is since we will be needing to save up for the trip. In fact, today I'm going to fish out my pictures from my trip! It was the BEST vacation I ever took in my life! !